Lumbar facet blocks are a common form of nonsurgical treatment for pain in the lower back. The procedure was first reported over 50 years ago as a conservative approach for treating lumbar back pain. The dual objective of a lumbar facet block is to reduce inflammation and identify the source of pain through the injection of anesthetic and steroid medication into the facet joints. 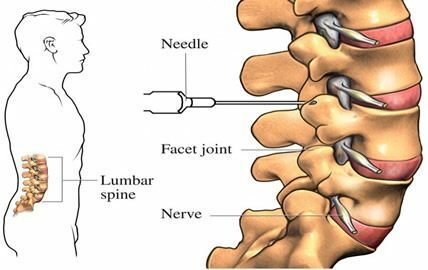 In this capacity, lumbar facet injections can provide therapeutic as well as diagnostic benefits. 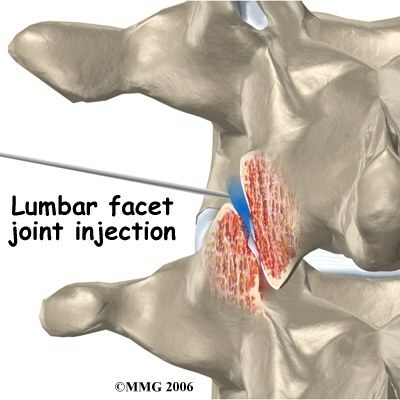 If the pain dissipates after the injection, it is most likely that inflammation in the facet joint area was the cause. The basic anatomy of the facet joints can help explain how lumbar facet blocks work. The facet joints provide stability to the back during twisting and bending movements. These bony knobs, also known as zygapophysial joints, are separated by a thin layer of cartilage and are located on both sides of the spine. They are surrounded by a capsule that is filled with synovial lubricating fluid. Chronic pain often develops from degenerative changes to these joints that result in pain and inflammation. Prior to the procedure, the patient is positioned face-down on an x-ray table. The patient’s skin is then sterilized and prepared for the injection. If IV sedation is used, vital signs such as blood pressure, heart rate, and breathing will be monitored throughout the procedure. Next, the physician injects dye into the area that will be observed through a special real-time x-ray, known as a fluoroscope x-ray. Once the contrast dye is injected to locate the exact area, the physician then injects a combination of anesthetic and a long-lasting steroid medication into the facet joint area. At the conclusion of the procedure, a band-aid is placed on the area of the injection. The procedure takes approximately fifteen minutes. Patients typically feel the pain-relieving benefits within a couple days after the injection. Research has supported the role of lumbar facet blocks as both a therapeutic and diagnostic tool to manage lower back pain. One recently reported study evaluated the outcome of lumbar facet blocks in patients with low back pain. During this investigation, patients were monitored for a period of nine months after receiving a lumbar facet block for lumbar pain. The results of the investigation revealed that the lumbar facet blocks were successful in alleviating pain in 74% of the test participants. Studies have also focused on the accuracy of diagnostic lumbar facet joint nerve blocks. One study reported in a 2009 edition of Pain Physician, conducted a two year follow-up on patients that received diagnostic lumbar facet blocks to investigate for potential facet joint degeneration. The outcome of this study revealed that the diagnostic blocks were successful in identifying the facet joints as the source of pain in 93% of the test subjects after a one year observational period and 89.5% after a two year follow-up study. Lumbar facet blocks are considered safe procedures; however, as with all procedures, there is some risk of complications, which include nerve damage, bleeding, headaches, and infection. The patient may also be sore at the site of the injection for about a week following the procedure. Lumbar facet blocks are typically performed on patients as part of the workup for lower back pain that requires additional testing beyond imaging studies to help identify the source of pain. Patients referred for lumbar facet blocks frequently show signs of facet degeneration and pain caused by lumbar facet syndrome. Patients with lumbar facet syndrome often feel pain in the lower back area that radiates to the buttocks and hip area. This pain is typically exasperated during movement, such as extension of the spine. Successful lumbar facet blocks relieve this pain and therefore confirm the facet joint as the source of the pain. Lumbar facet blocks play a key role in a conservative pain management program for lower back pain. Once a diagnostic lumbar facet block reveals the source of chronic lower back pain, doctors and patients can make informed choices regarding an ongoing pain management program. Along with locating the cause of the pain, successful lumbar facet blocks provide the added benefit of improving function and quality of life without the need for invasive back surgery. Manchikani L, Singh V, Faclo F, Cash L Pampati V. Evaluation of lumbar facet-joint nerve blocks in managing chronic low back pain: a randomized, double blind, controlled trial with a 2-year follow-up. Int J Med Sci. 2010;7(3):124-135. Riew KD, Park JB, Cho YS. Nerve root blocks in the treatment of lumbar radicular pain. A minimum five-year follw-up. J Bone Joint Surg AM. 2006;88(8):1722-1725.